Part of: Bucket List: Give a TEDx Talk. I’m on the path to the TEDx stage and I wanted to hear directly from some TEDx speakers. See more on this series Here and Here. 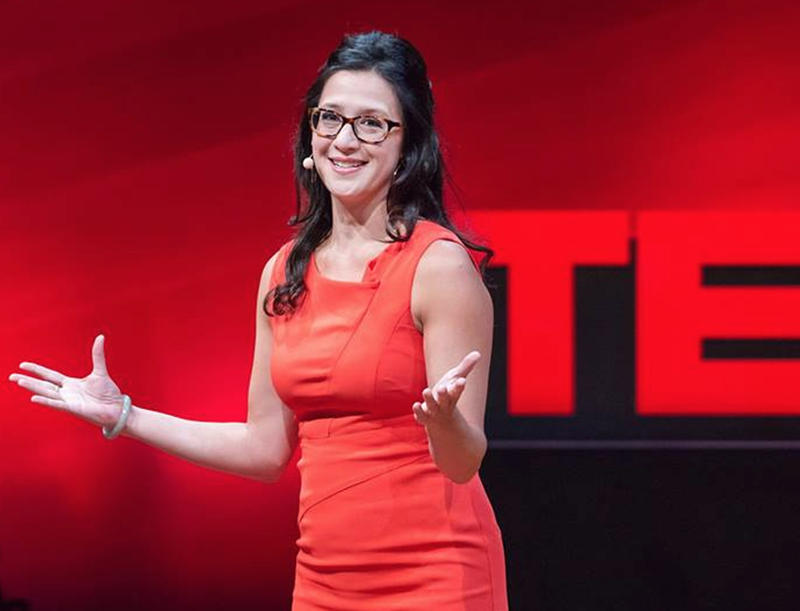 Today we’re hearing from Terri Trespicio who I’m lucky enough to know personally and her experiences with the TEDx stage inspired me greatly to put this on the bucket list to begin with. You can watch her talk Stop searching for your passion which has been watched by over 2,275,000 people. Have you shared your idea before or was TEDx your first time sharing that particular idea? I had probably blogged about it in one way or another, and I certainly had been kicking it around in my head for a while. It was like a sea creature, swimming around in the murky depths and I wasn’t quite sure the shape or form, but I knew it was down there. Then, when the opportunity to pitch an idea for TEDxKC came up, it leapt to the surface like a great whale. I have since written about it here. Did you find and apply to TEDx or did the organizers reach out to you? A little of both. The organizer himself did not reach out. There was this man whom I literally had been only FB friends with, this guy I had never actually met or worked with or anything, just a fan who had read and seen stuff of mine and was kind of along for the ride, and he was an employee of VML, the digital ad agency who organizes TEDxKC. He heard that a speaker had dropped out and he threw me a bone. He messaged me on FB and was like, “Hey you should apply to do a TEDx talk here. I’ll put you in touch with the guy if you want.” And I was like, “ummmm yes please!” So he connected me with Mike Lundgren, the organizer. I had no idea if I was in yet, if I was still being considered or if we were in development mode. And PS, all the other speakers had known they were delivering a talk at the August 29 event. But this was getting toward the end of July. So time was tight to say the least. What did you think or feel as you found out you were selected? Oh I know what got me in. He said by the second or third day that he loved that I was acting as if this was a fait accompli (a thing that has already been decided, leaving the person with no option but to accept). I said, “Oh I hope I’m not being too presumptuous!” and he said, No. Not at all. He liked that I was committed. That I was running with this and treating it like it was a done deal. There’s a lesson there: Commit. Act as if this is already happening. Half assing will get you nowhere, and people don’t trust someone who’s unsure. I was all in, and he knew it. Did you have a speaking coach? Nope. I am a speaking coach. Though trust me, I learned a LOT through this practice. Mike was a very hands-on TEDx organizer (and not all are) and I learned a TREMENDOUS amount under his tutelage during that hair-raising one month I had to create and memorize my talk. But I did not hire a coach, no. Every day I worked on it, and tweaked it and sent in scripts for Mike to edit, and we really closely tailored that talk to within an inch of its life. Again, we didn’t have a lot of time, so we were on full throttle and figuring it out for most of that time. I probably spent the last week memorizing it. And I did it by saying it out loud over and over, one chunk at a time, then adding another chunk. I didn’t use slides, so it was straight memorization, which I found helpful because it gives you less work to do when you’re there on stage — you reach for what you know. I’ll add this: I didn’t have the final final ending until the day before, but when I landed on it, I KNEW that was the ending I wanted. Are you hoping to do another one? I did another one! Less than a year later I was invited to deliver a TEDx talk at TEDxStLouisWomen — they reached out to me because they loved my first talk, which to date has gotten more than 2 million views. That second one hasn’t gotten much play yet, but it’s also close to my heart! Did your TEDx create new opportunities? More than I expected, not just “hey nice talk” but like, letters from around the globe, from people in India telling you that you changed their life. That’s not a small thing. Would you do anything differently to prepare? No. I think that you have to get the talk where you want it, and learn the hell out of it. Know it so well you can say it in your sleep. Know it so well you don’t have to think about the words or worry about them — and so you can really SPEAK them, and live them. If you’re unsure of the words, it shows, because it detracts from the force and momentum behind the message. Don’t let your own words get in the way. Own them so they can work for you. How has your idea evolved since your TEDx? Hmm. I don’t know that I have changed my idea at all. But it has inspired ideas that have grown from it like branches on that tree. People kind of know me for that idea now, and that means I can stretch it further, apply it elsewhere. It becomes that base from which my other ideas spring. I will say this: giving a talk is a great way to firm up any message, and make you get clear on it. I just gave a talk at a conference on how to re-inspire your work and life by tapping your innate creativity, and in many ways that’s a cousin idea to the TEDx talk. Good ideas, and by that I mean ones that are well received, beget more good ideas. When you get a powerful response to something you say, then you know you’re headed in the right direction. “Commit. Act as if this is already happening. Half-assing will get you nowhere” Real talk, I’ve been dipping my toes in the water….it’s time to COMMIT and in bigger ways. We’re going to talk about that next. “Know it so well you can say it in your sleep” There’s no room for “winging it” so practice and practice and practice again. “When you get a powerful response to something you say, then you know you’re headed in the right direction.” This really resonated with me because I’m big on signs and the reassurance that I’ll have signs letting me know I’m going in the right direction is really helpful. “Every day I worked on it, and tweaked it.” This isn’t something to be worked on every other Tuesday and ties right back to the big takeaway of committing.